As House Republicans plan to roll out their own proposals to reform the nation’s immigration system, polls continue to show a majority of Americans support some pathway to legal status for the 11.7 million unauthorized immigrants living in the U.S.
Roughly-two thirds of Americans favor either a pathway to citizenship for unauthorized immigrants (54%) or a way to stay in the U.S. legally without citizenship (12%), according to a CBS News poll last week. That includes support from about three-in-four Democrats (74%) and about half (52%) of Republicans. Three Pew Research surveys during last year’s immigration debate also showed strong support for allowing immigrants who live in the U.S. illegally a way to stay. In June, just before the Senate passed a comprehensive bill with a pathway to full citizenship, seven-in-ten (71%) U.S. adults said there should be a way for these immigrants to gain some form of legal status. This was supported by a 61% majority of Republicans, seven-in-ten independents (69%) and eight-in-ten Democrats (80%). But the issue of citizenship has been more divisive. In a May Pew Research survey, 44% supported a path to citizenship and one-in-four (25%) said that immigrants here illegally should only be allowed to apply for permanent residency. About half of Democrats (52%) supported full citizenship then, compared with 35% of Republicans. While majorities of both parties agreed that legislation should include increased border security, Republicans have clear views that undocumented immigrants should be allowed to apply for legal status only after the borders are secured. A majority of Republicans (56%) said that effective border control should be established before immigrants could apply for legal status and 38% said it should not. Democrats had nearly opposite views, with just a third (35%) saying that applications should wait for effective border control to occur, and six-in-ten (60%) saying undocumented immigrants should be allowed to apply while border improvements were being made. There were also partisan disagreements over what kind of impact would come from granting legal status to millions of unauthorized immigrants who entered the country illegally. About three-in-four Republicans thought that doing so would encourage more people to come to the U.S. illegally and that it would be a drain on government services; about half of Democrats agreed. A greater share of Republicans also believed that legal status for those who live here illegally would reward such behavior and take jobs from U.S. citizens. But a substantial majority of both parties said that deporting all unauthorized immigrants would be unrealistic and that it would be better for the economy if they became legal workers. Politically, many Republicans said in June that the GOP would benefit if they supported a way to provide legal status for immigrants who are in the country illegally. About twice as many said that support for legal status would help the party in national elections (39%) as hurt the party (20%), with about four-in-ten (38%) saying it wouldn’t make much difference. And while members of the Tea Party expressed greater concern about some aspects of a path to legal status, their views on the electoral impact were the same as those of other Republicans. 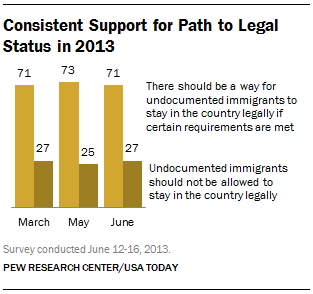 As of right now, the public isn’t placing immigration at the top of its to-do list for 2014. When asked last week about priorities for the president and Congress this year, roughly four-in-ten Americans (41%) said that dealing with illegal immigration was a top priority — far below issues such as the economy (80%), terrorism (73%) and education (69%). And there is no significant difference between partisans’ views of immigration as a priority.